Memorable moments can occur daily, given the 80-game slate of a typical night in the Minors. But sometimes, the most exciting, unique or silly highlights can live on in the hearts of fans and on the mantels of players forever. MiLB.com searched the archives for the top defensive plays, home runs and bloopers from the 2018 season. Hear from the players involved and get a deeper look into the three videos voted by fans to earn MiLBY Awards. The catch of the year took Cole Peterson's breath away. 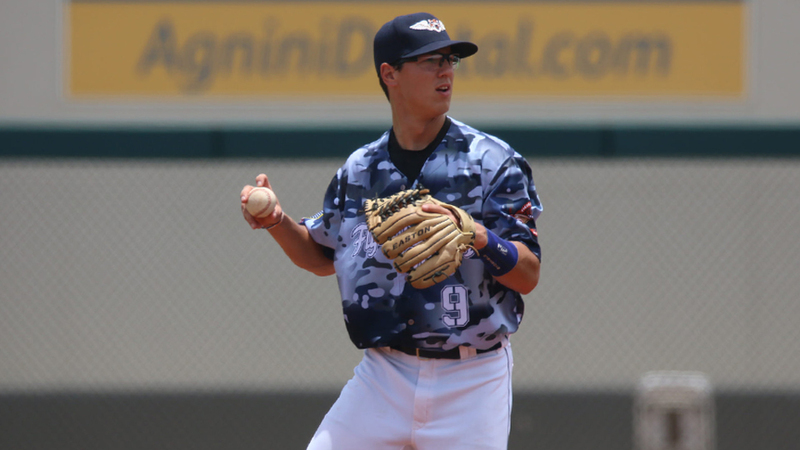 In Game 1 of a doubleheader on May 22, the Class A West Michigan shortstop knew that any hit would be big in the sixth frame of a seven-inning game. With one out, Tirso Ornelas dug in against highly touted right-hander Matt Manning. "He is one of their power hitters and he can drive the ball gap-to-gap," Peterson said. "I know our left fielder [Garrett McCain] was playing deep and our pitcher made a good pitch, got him to make an inside-out swing." Peterson took off. As the ball began to sink, the St. Bonaventure product listened for McCain to call him off, but didn't hear anything. "It happens so fast," the 23-year-old said. "I was just moving, trying to make a play on the ball and keeping my ears open." At the last second, Peterson shouted, "I got it!" and as he lunged into the air, made the catch and dove across the grass -- all while avoiding the approaching McCain. The 2017 Draft pick quickly popped back up and threw the ball in before putting his head down. From the outside, it looked like Peterson was keeping it business as usual, but on the inside he was trying to compose himself. "I think I knocked the wind out of myself for a second or two," he said. "But after I stood up and tossed the ball in, I took a couple steps and I was good to go." An out later, Peterson and his Whitecaps teammates returned to the dugout, where the Tigers' No. 2 prospect was eager to thank him. "[Manning's] just laughing, shaking his head and saying, 'Unbelievable catch, man. I appreciate it,'" Peterson recalled. "And I just said, 'Hey, you're doing your job, I'm doing mine.'" Peterson showcased his defense all season, posting a .981 fielding percentage while diversifying with time at second and third after a promotion to Class A Advanced Lakeland. But no matter the position, the 5-foot-11 fielder said he's always going to put his body on the line for the catch. "Defense is my strongest [tool]. I know that, and I take pride in my defense," he said. "So to go out and make plays and make a diving play like that, it means a lot to me." While Peterson has racked up the grass and dirt stains over his first two pro seasons, making multiple plays that have gone viral, it's that MiLBY-winning catch from May that he considers No. 1. "It just happened so fast and when I see the video sometimes, I think to myself, 'How did I get to that?'" he said. "Sometimes I think, 'Wow, I can't believe I actually caught it.'" After going hitless through eight innings, Corey Ray stepped up in the ninth with a plan. With his team down one, Clint Coulter at first and one out, the Double-A Biloxi leadoff hitter just wanted to "elevate the ball." "I didn't want to hit the ball on the ground, whether it be hard or soft, because there's a chance for a double play," he said. "So I was looking for something I could elevate. And in that ballpark, I think if you elevate it to the corners, you have a better shot. If you elevate to center, it's a little tough." With right field on his mind, the left-handed hitter was offered a 2-1 cutter from Jacksonville's Marcus Crescentini. "I didn't miss it," Ray said. The Brewers' No. 2 prospect knew it was a blast as soon as he made contact -- he was just hoping it'd stay fair. The ball quickly soared left of the foul pole and right of a flag pole as it flew out of the stadium and toward a parking garage for Biloxi's first walk-off of the season. "Everybody went crazy," the 24-year-old said. "I think the team was happy because we didn't have to go into extra innings." Before his teammates could go home, Ray had to figure out how he was going to get to home plate. Thinking about avoiding the Gatorade bucket while also avoiding injuries that past walk-off heroes have endured, the University of Louisville product opted to slide. Ray found brief success as he stayed dry, but then trouble found him while he was doing a postgame interview. "I forgot there were two Gatorade pails," he said with a laugh. "[It was] cold -- very, very cold -- but I think it might have been my first [Gatorade shower], so it was a milestone." Although he was not aware, that roundtripper ended Ray's longest homer-less drought of the season -- a 23-game span. The MiLBY-winning jack potentially propelled his most powerful season yet as the 2016 first-rounder drilled 27 homers to lead Brewers Minor Leaguers. "Getting better pitches to swing at," he said of the improvement. "I think I went up there with some type of plan, and I think if you go up with some type of plan and you stick to that plan no matter what it is, you'll be more successful than going up there and just trying to hit the ball." Four months and two days after his heroics, Ray looked up at the videoboard at MGM Park. To pump up the crowd before the first postseason game, Biloxi played a best-of video from the past season, which of course included the Chicago native's walk-off. "I think it's always good when you see yourself on video and you're hitting a home run," he said with a laugh. "It always looks more exciting on TV, I think ... because you're able to take a step back and look at everybody and everything, things that you didn't pick up while you were in the moment, you pick up on video." Class A Wisconsin's walk-off win on Aug. 10 was so wild, the players didn't know how to celebrate. The Timber Rattlers entered the bottom of the ninth down four runs. Seven batters later, they cut the lead to two as Nic Pierre stepped to the plate. With the bases loaded and two outs, Payton Henry, who was standing at third, felt his internal coach. "OK, two outs, anything hit I'm going," he thought. "Passed ball, I'm going." Pierre quickly struck out on three pitches, but the play -- and the game -- was far from over. Like Henry prepared for, a wild pitch from James Ziemba got past catcher Keinner Pina. The Brewers prospect immediately took off and slid home, not noticing the pitcher wasn't covering the plate. As Henry popped up, he realized Pina's throw raced past the glove of first baseman Kiki Menendez. Now it was time for the 21-year-old to coach his teammates. "I was like, 'Holy crap we have a chance to win this,'" he thought. "So I just started waving my arms as fast as I could to everybody like, 'Let's go, let's go, come on, get around home.' We were down two, so I scored and the next guy [Kenny Corey] scored and I was like, 'Holy cow, he still doesn't have the ball yet.'" While Corey was running home, Henry was jumping faster and faster, but as the go-ahead runner, Gabriel Garcia, approached the plate, the Utah native dropped to the ground. "Get down! Get down!" he told Garcia. The Wisconsin third baseman did as he was told, "gliding" face first as he swiped the plate, just avoiding Pina's tag. After their final strike, the Timber Rattlers won the game. "We didn't really know who to jump on or who to praise because it was a walk-off strikeout," Henry said. "It was weird. It was like, 'Let's all jump on each other.' And I guess we all did something right." The weird fun continued as Henry went to leap at Pierre, but had his own "whiff,' missing the No. 9 hitter. Henry said Pierre was a little confused because he was happy they won, but also wasn't feeling great about striking out with the bases loaded in the ninth. And while a 'W' doesn't care how it's achieved or celebrated, the unique victory earned a MiLBY. "It was fun to be able to do that for the fans, just a blooper like that," Henry said. "Those people are never going to see that again and it might never happen again, so it was funny."